Only because it's hotter than you know what and summer is winding down and I saw the thing sitting on my desk, I thought I'd conjure Christmas this morning. The Great Monday Give this sizzling day is a tight, vintage copy of the holiday tale starring everyone's favorite river otter. All you have to do to be entered this win Emmet Otter's Jug-Band Christmas is comment on this post before 11:59 PM Sunday, August 8... a winner will be selected at random and announced the next day. Last week's prize of A Hole is To Dig, goes to Alisha. E-mail me your info to webe(at)soon(dot)com and congrats! That's it for now kids. See you in a few with a new review. Oh this was our daughters' favorite Christmas show for many years. Let me enter this for them! Oh, I remember this, and we'd love to own a copy. What a great find. Thanks! We don't have this one yet! Thanks for the opportunity to win and for this contest! Oh, this is one of the sweetest stories ever! I'd love a chance to win this copy. Thanks! Love your blog; I also adore books. This book would be great for my critter and music loving son! Thanks for giving it away. We'd love to add this to DD's library. Thanks for the chance. All Muppets aside, we've somehow missed this Russell and Lillian Hoban outing (in book form). Enter me! Thank for offering it! I'm a fan of the Henson movie. 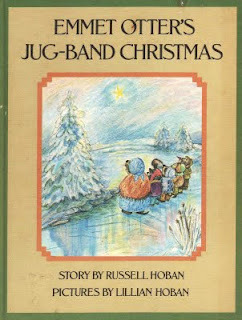 I remember watching this adorable Christms show ~ I'd love to win a copy of the book! Oooh, the movie is a Christmas tradition at our house! Thanks for the chance to win - I didn't even realize it was based on a book! ooooh! i love a good russell hoban book! ooooh! i love a good russell hoban book. Ooooh, I love otters! And I just organized our Christmas picture books to have them all in one place come December. I'd love to win and add this to our collection! Awwwww, I've never read the book but I remember seeing the Jim Henson TV special based on it. Loved it as a kid and love it now. I loved this as a kid and would love to share it with my girls! Blogger is giving me troubles so if my other comment went through please delete this one. It's good to see this old friend again. I'd love to win a copy. Got to love Emmet! A true fave at Christmastime. I just bought the video last year! the kids in my class would love this! I am not familiar with this one, but it looks so cute I cannot resist. Actually, I LOVE Christmas in July and August. On some of the hottest and most long-stretching days, I have been known to pop in a Christmas classic and watch it with my kids. It works to distract from the heat and focus on something a little cooler. Plus, it fills the heart with sweet memories to remember and anticipation for the coming holidays. sigh... Great stuff! I'd love to add this to our Christmas collection! This was my favorite book and movie when I was a child. Please enter me in this giveaway! !